UNENCUMBERED (AUS) (Bay or Brown 2011-Stud 2014). 5 wins at 2, A$1,908,850, BRC BJ McLachlan S., Gr.3, GCTC Magic Millions 2YO Classic, RL, Wyong Magic Millions 2YO Classic, RL, ATC Ascend Sale Trophies 2YO P., Sharp 2YO P., 2d ATC Todman S., Gr.2. Out of SW Blizzardly. Related to SW Rembetica and SW Sober Dancer. Sire of Double Bubble, Expedius, King Percy, Juanito Uvez and of the placegetters Brave Jewel, Hocked, I Stole Your Love, Injustice, Mirette, Nothing Needed, Reason to Smile, Soaring Eagle, etc. His oldest progeny are 2YOs. My Names Bruce (g. by Sharkbite). 3 wins at 1400m, 1600m to 2016-17 in Aust. Latino Babe (f. by Stryker). Placed at 2 in 2016-17, 3d MVRC William Hill 2YO P.
Sancerre. 4 wins from 1200m to 2200m, Waikato RC Brighthill Farm H., 2d ARC Auckland Co-Op Taxis H., Tip Top H., BOP RC Triton Pacific Owen P., 3d Taranaki RC Waterfront Hotel H.
CHAMP ELECT (Choisir). 3 wins-2 at 2-at 1000m, 1100m, A$124,600, to 2017-18, BRC Calaway Gal S., L, Dr Lilian Cooper 2YO H.
BOLTON (Zabeel). 8 wins from 1200m to 2000m, A$298,774, MRC Victoria Cup, L, VRC SES Victorian Volunteers H., 2d Darwin Cup, Darwin TC Chief Minister's Cup, MRC Betfair H., 3d Alice Springs Cup, MRC Carlton Draught H., MVRC LF Signs & Designs H.
Jactris. 3 wins. See above. Carnegie Success. 5 wins from 1500m to 1800m in Aust. and Macau, 2d MVRC Assessing & Training Services H.
Delbury. 2 wins at 1600m, 2000m, Singapore TC Initiation P., Class 5 H., 2d Singapore TC Class 3 H., Class 5 H.
Frankenbeans. 6 wins from 1000m to 1600m, A$99,520, 3d ATC Sharp H.
Easy to Smile. 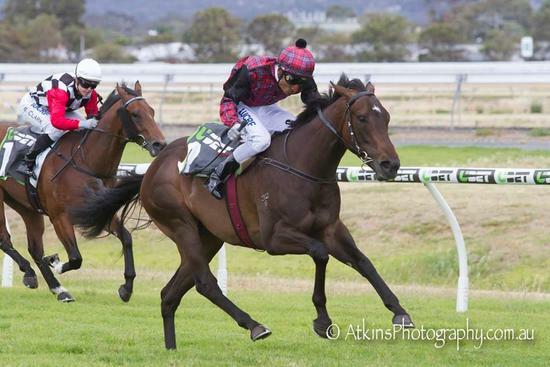 3 wins to 1400m, 3d BRC Skyracing.tv 2YO H.
Thames. Winner at 2200m, 3d SAJC Irish Day September P.
Auspicious Day. 2 wins at 1400m, 1600m in 2018, Singapore TC Debt Collector S., 2d Singapore TC Singapore Silver Horseshoe S., Trudeau S., 3d Singapore TC Inglis Ready2race S.
A TOUCH OF RUBY (Pins). 4 wins-1 at 2-from 1200m to 1600m, NZ$161,335, WRC Thorndon Mile, Gr.1, Avondale 2YO Classic, Counties RC Signmax H., 2d Waikato RC Hinuera Lodge H., 3d Matamata RC Fairview Motors Limited 3YO S.
REAL SUCCESS (Success Express). 6 wins. See above. Revenging. 5 wins from 1100m to 1600m, TTC Southern Cross H., 2d TTC Stallards Camera House H., The Examiner H., Craig Hanson Memorial H., 3d TRC Golf Club Veterans H., Bellerive Yacht Club H., TTC Frank Feeney H., Elite Protection Service H.
SMOKIN BAYOU (Smoke Glacken). 2 wins at 2, Monmouth Colleen S., L, 3d Monmouth Sorority S., L. Producer.